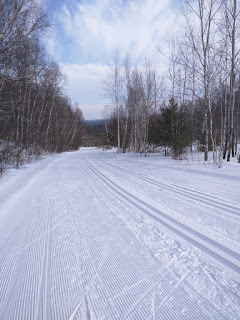 The holidays usually mark one thing in the US ski community: US Nationals (or Sr. Nationals) preparation. 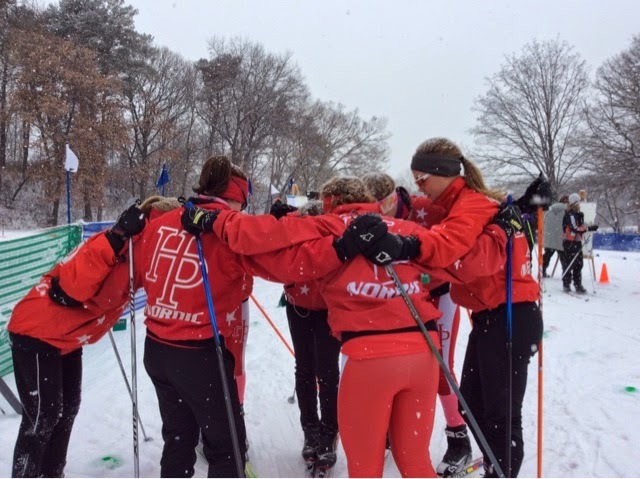 US Nationals usually occurs in the 2nd week of January, and it is used to create the U18 Scandinavian Cup and U23 Junior World Cup teams, and also provides an opportunity for stand out athletes at Nationals to be recognized by the US Ski Team coaches, and compete on the World Cup. For a junior athlete such as myself, these teams are a great way to get your leg in the door to internationals competitions. Throughout, the hundreds of hours of training I did this year, making the Scandinavian cup team was constantly in my head, and I was gearing up to be a competitive threat at US Nationals. As a high school athlete, I've had my share of injuries. 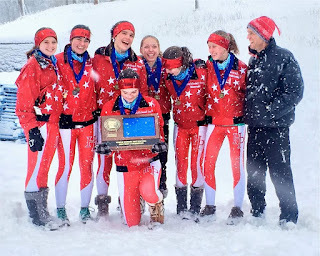 Since I've been a freshman, I've had tight IT bands, or pulled muscles after a cross country race, but since Nordic skiing and Cross country running are pretty safe sports, none of my injuries were very long term. This changed last November, after Thanksgiving. I was on a distance rollerski with my teammates and tripped over a grate. I had a shoulder subluxation, meaning it slid out and then back into it's socket. It was a shoulder dislocation to a lesser degree. In the beginning, I was okay, and while it was painful experience, I used the time afterwards to focus more on my leg strength, and I went easy a couple a weeks. It was a pretty easy recovery, although I was pretty restless. A month later, besides soreness, I couldn't tell anything weird had happened. I pretty much had forgotten about the incident. A question that is asked commonly here at Junior Nationals, is: What event are you most looking forwards to? For me, this is a difficult question, because I enjoy all of the races, and because of the shortage of racing this year, I don't really know what my strengths are. But one thing that I know I truly excel at is being able to push myself as needed: so if I'm in a group of girls that are going hard, I can stick with them, working harder than I normally would be if I was by myself. So in my view, the race I was most nervous about was the 5k individual start, where I'd have to push myself without anyone around me. 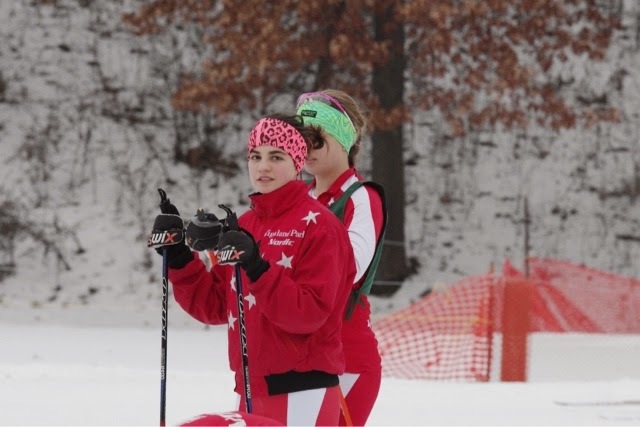 Cover the past couple years, I've completed many routines, all part of the life of a teenage nordic ski competitor. One of these routines is ski racing. 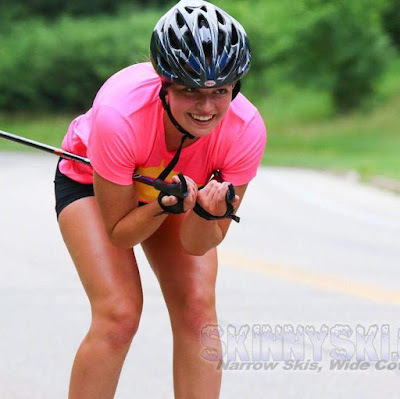 I've done a whole lot of skiing racing. 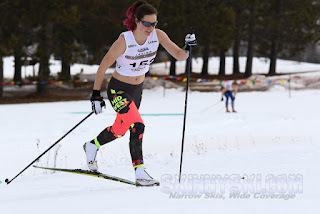 Through high school races, JNQ, Junior Nationals, Senior Nationals, and just ordinary citizen races, I've gained confidence in my ability to adapt to different courses, different living situations, race starts, snow conditions. I have race warm ups engraved in my head, day-before-race-day-workouts. I'm started to learn all the preparation it takes to get everything ready for race time, from my body and head to my skis. I have mental checklists of what I have to do, and having the confidence that everything is going to the way it's suppose to is a big bonus on race day. One of the biggest things that I have learned as a competitive skier is that you can't let past results affect your current races. This has been especially relevant for me for the past couple weeks, and I'm excited to share my experiences. 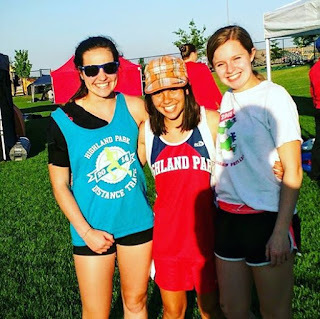 It all started out with my Section 3 meet; the qualifying meet before the state meet. My plan was fairly simple and straight forward. I was heavily favored to win, but my plan was to race it like I would at the State Meet, put it on the line and race hard. It was the last meet before the big races, and I was using it as a tune up for the State Meet. I started out hard in the classic Individual start, and I definitely paid dearly for that on the second lap. I suffered, but held up and tried to finish as hard as I could. I wasn't pleased with my results, I only had a 30 second lead, and I had been expecting much more. I rested up to pull through with a win in the state race, something I had assumed to be guaranteed.